Pack size: 1 x 10g tube. Dry eyes can be a nightmare for contact lens wearers, and it is essential that you do what you can to alleviate dryness. 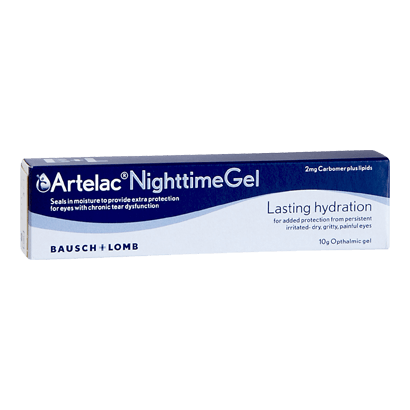 With the Artelac Nighttime Gel from optical experts Bausch and Lomb, conditions like eyelid dysfunction or lipid-deficiency can be combated, and eyes can be restored to optimum moisture levels. Simply apply the Artelac Nighttime Gel before retiring to sleep, and avoid vision nightmares that dry eyes can cause. • The Artelac Nighttime Gel is an effective treatment for common dryness conditions such as eyelid dysfunction or chronic tear dysfunction. These conditions can cause chronic drying of the eyes, leading to extremely uncomfortable contact lens wearing. • Apply overnight for an easy to follow, convenient regimen and restore eye moisture with ease. • Artelac Nighttime Gel works by supplementing the body's own mechanisms for ensuring that eyes are moisturised. • Comes in a 10g tube which is intended to last for 28 days before replacement will be needed. • Substances used in the gel include Cetrimide Preservative, Carbomer, lipids and sterilized water. • Seal in moisture that the body produces and lubricate the eye during the day, by applying the Artelac Gel overnight. This gel will be ideal for anyone who wears lenses and suffers from dry eyes. Travellers, office workers - anyone who has a busy schedule will benefit from this handy solution.